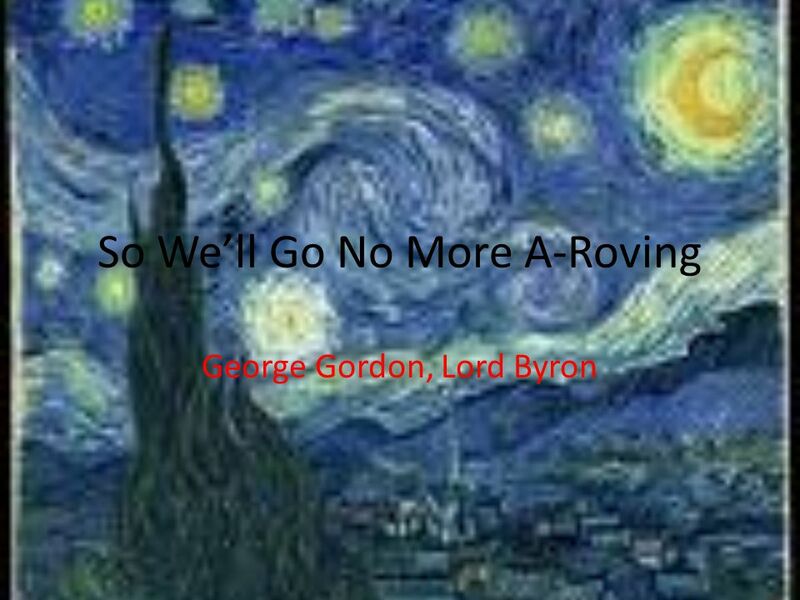 So We’ll Go No More A-Roving George Gordon, Lord Byron. 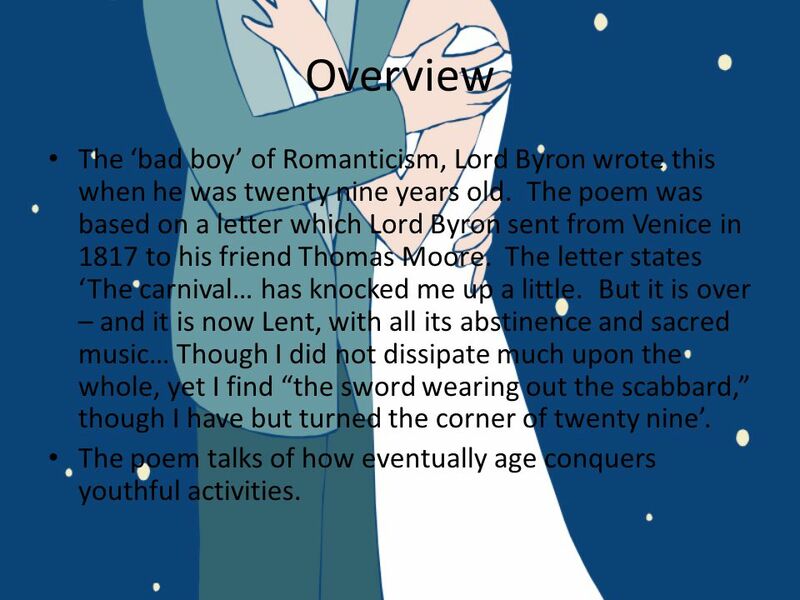 2 Overview The ‘bad boy’ of Romanticism, Lord Byron wrote this when he was twenty nine years old. The poem was based on a letter which Lord Byron sent from Venice in 1817 to his friend Thomas Moore. The letter states ‘The carnival… has knocked me up a little. But it is over – and it is now Lent, with all its abstinence and sacred music… Though I did not dissipate much upon the whole, yet I find “the sword wearing out the scabbard,” though I have but turned the corner of twenty nine’. The poem talks of how eventually age conquers youthful activities. 3 Structure The poem is in three short stanzas. Each stanza contains only four lines. It follows a simple abab rhyme scheme which gives the poem a lyrical quality. Stanza 1 and Stanza 3 follow a similar jaunty pace, whereas stanza 2 is slower and creates a more solemn mood. 4 Style Byron uses simple and repetitive diction and imagery to create a timeless and melancholy short piece. The first line uses multiple long ‘o’ sounds – ‘So, we’ll go no more a-roving’ which immediately captures the tone of the poem. The long ‘o’ sound is repeated throughout the poem to continue the sadness the character feels at leaving his partying days behind. 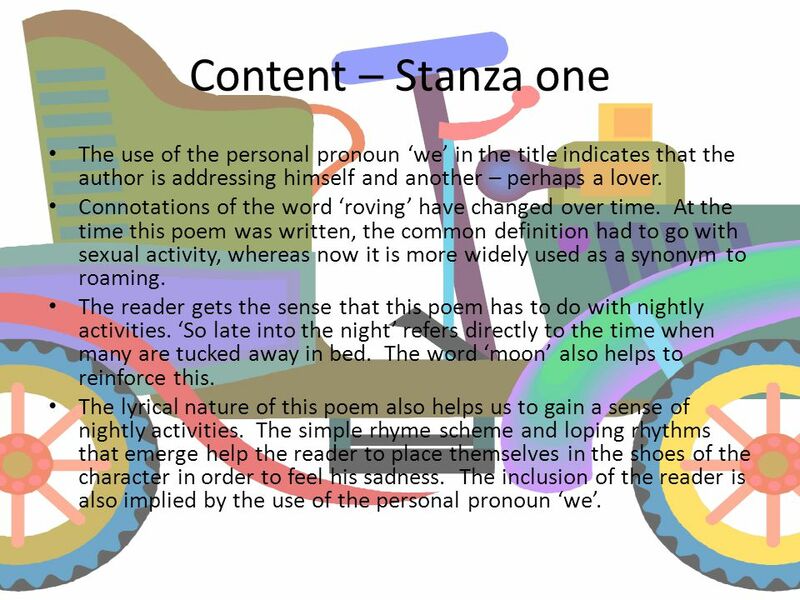 5 Content – Stanza one The use of the personal pronoun ‘we’ in the title indicates that the author is addressing himself and another – perhaps a lover. Connotations of the word ‘roving’ have changed over time. At the time this poem was written, the common definition had to go with sexual activity, whereas now it is more widely used as a synonym to roaming. The reader gets the sense that this poem has to do with nightly activities. ‘So late into the night’ refers directly to the time when many are tucked away in bed. The word ‘moon’ also helps to reinforce this. The lyrical nature of this poem also helps us to gain a sense of nightly activities. The simple rhyme scheme and loping rhythms that emerge help the reader to place themselves in the shoes of the character in order to feel his sadness. The inclusion of the reader is also implied by the use of the personal pronoun ‘we’. 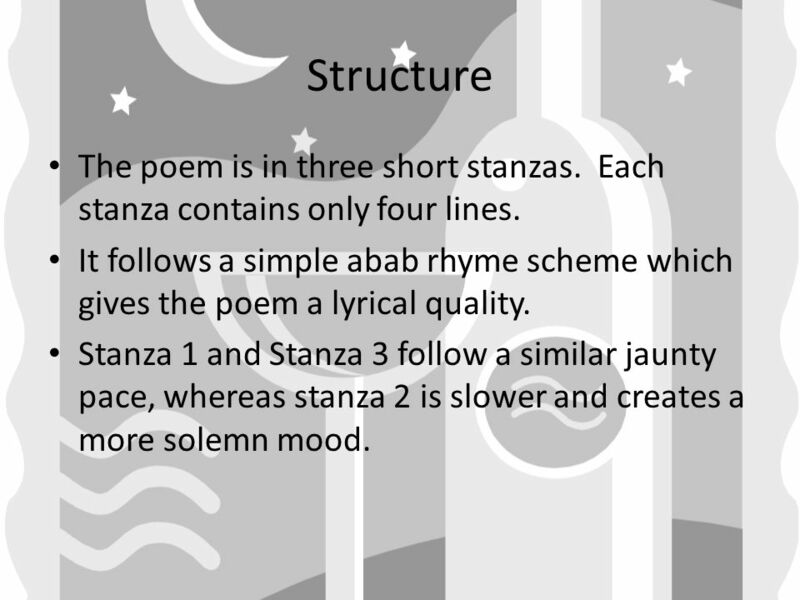 6 Content – Stanza two There are multiple meanings to do with this stanza. ‘For the sword outwears its sheath’ refers directly to the letter, in which Lord Byron was expressing that his soul has outworn his body. This helps the reader to realise that although his soul wants to continue this lifestyle, his body is unable to keep up. 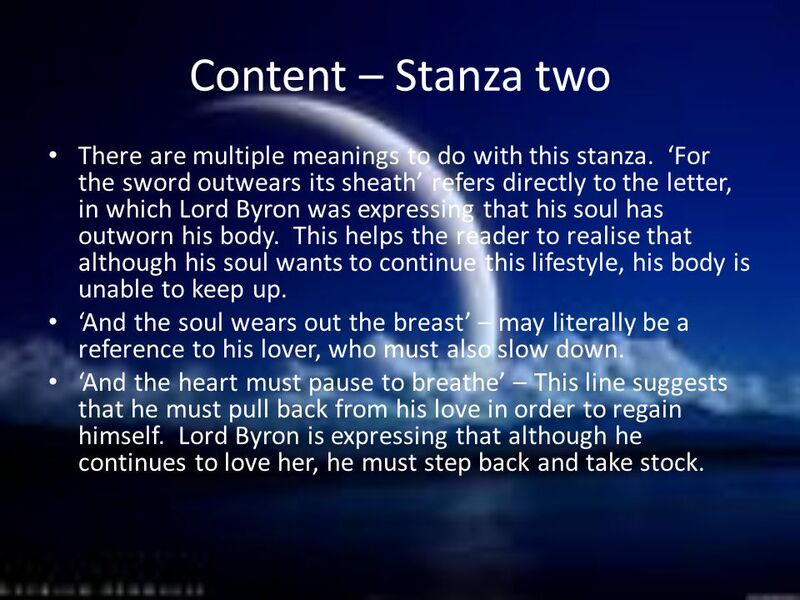 ‘And the soul wears out the breast’ – may literally be a reference to his lover, who must also slow down. ‘And the heart must pause to breathe’ – This line suggests that he must pull back from his love in order to regain himself. Lord Byron is expressing that although he continues to love her, he must step back and take stock. 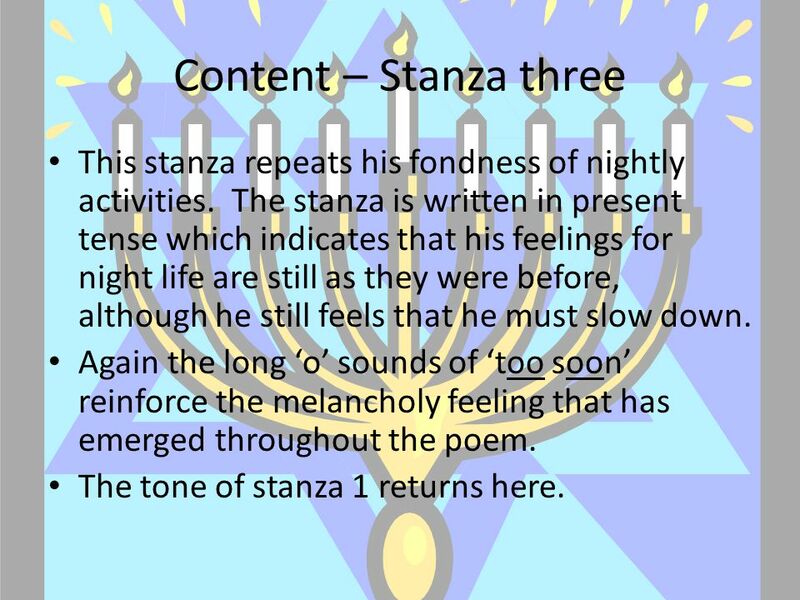 7 Content – Stanza three This stanza repeats his fondness of nightly activities. The stanza is written in present tense which indicates that his feelings for night life are still as they were before, although he still feels that he must slow down. Again the long ‘o’ sounds of ‘too soon’ reinforce the melancholy feeling that has emerged throughout the poem. The tone of stanza 1 returns here. 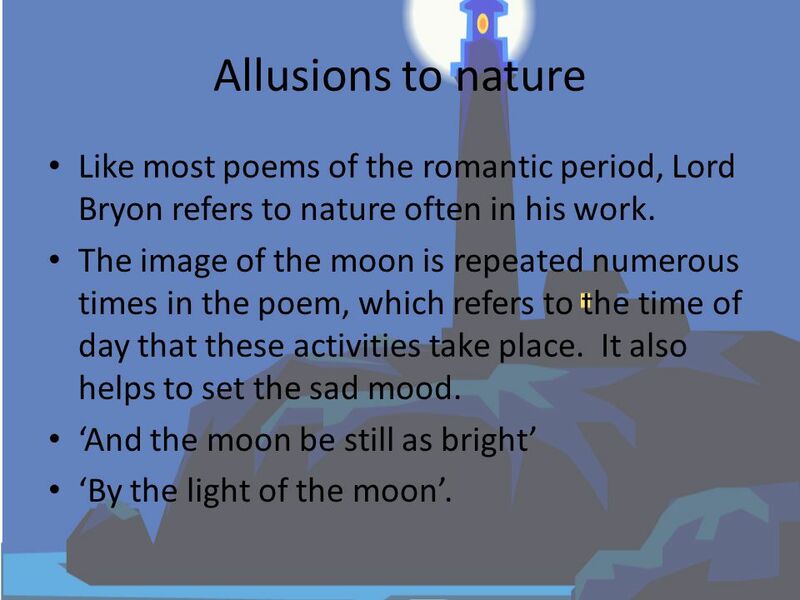 8 Allusions to nature Like most poems of the romantic period, Lord Bryon refers to nature often in his work. The image of the moon is repeated numerous times in the poem, which refers to the time of day that these activities take place. It also helps to set the sad mood. ‘And the moon be still as bright’ ‘By the light of the moon’. 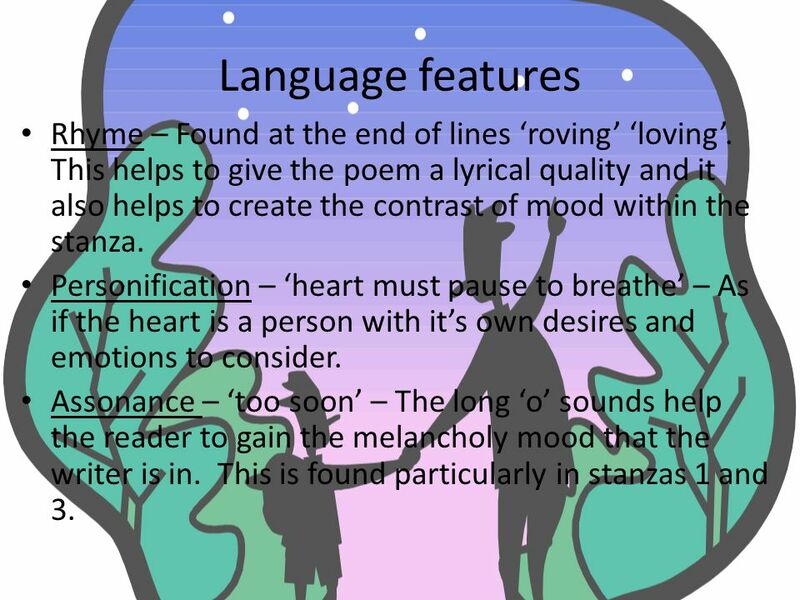 9 Language features Rhyme – Found at the end of lines ‘roving’ ‘loving’. This helps to give the poem a lyrical quality and it also helps to create the contrast of mood within the stanza. Personification – ‘heart must pause to breathe’ – As if the heart is a person with it’s own desires and emotions to consider. Assonance – ‘too soon’ – The long ‘o’ sounds help the reader to gain the melancholy mood that the writer is in. This is found particularly in stanzas 1 and 3. Download ppt "So We’ll Go No More A-Roving George Gordon, Lord Byron." Song for Last Year’s Wife By Brian Patten LO: To evaluate how Patten uses language, viewpoint and comparison to convey a sense of loss. By Meijie Hu Because I Liked you Better A.E. Housman. So We’ll Go No More A-Roving. This song is about heartbreak. Because one person sad and he only need his lover when he let her go. The guy left his girlfriend and he sad. He miss her. 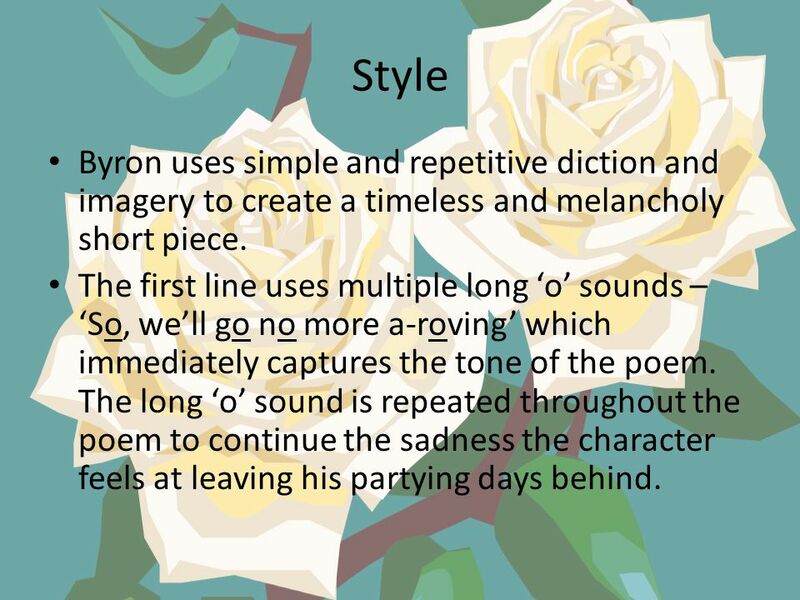 TP-CASTT Poetry Analysis 1/09 Poetry Unit: TP-CASTT - Blume 1 repetition! onomatopoeia! By: Charlotte Mew. Mew’s Background Charlotte Mary Mew (15 November 1869 –24 March 1928) was an English poet Her father died in 1898 two of her siblings. Poetry Poetry is just the evidence of life. If your life is burning well, poetry is just the ash. ~Leonard Cohen. Poetry “Wheel”. Notes before we begin: O Refer to any author by his or her last name O The speaker isn’t necessarily the poet O A poem that tells a story. Name: George Gordon Noel Byron, 6 th Baron Byron Born January 22,1788 in London, England He was born with a club foot. A club foot is a deformed foot. Complete this statement: Writers use figurative language and sound devices to make their poems or stories sound more _____________.